In this world where people follow weird routines and spend hours sitting in an unhealthy posture in front of a laptop, a T.V set or a computer, it is generally observed that people of all age groups suffer from back pain that originates from the muscles ,joints , nerves , bones and due to various other reasons. It is an ongoing pain that the majority of masses experience everyday as their busy schedule hardly gives them time for physical movements rather this pain is usually ignored . In such cases we fling to the painkillers that suppress this pain for a while but leave us with the side effects. This attitude of ours sometimes destroys our inner stamina and makes us weak thus it is vital to tackle the pain beforehand rather than making it a root cause for many other diseases. Back pain can be classified into various categories such as Acute Back Pain, Chronic Back Pain, Lower Back Pain, Herniated Discs, Spondylolistthesis, Ankylosing Spondylitis, Lordosis. 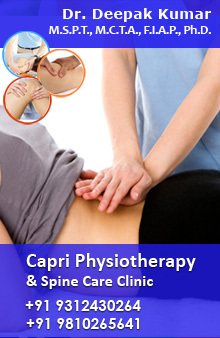 The best way to overcome this menace of back pain is to go for regular Physiotherapy treatments which are best provided by Delhi physio which believes in curing this pain from its roots. Sciatic nerves are the nerves which run down the spines and when these nerves get inflamed they cause great deal of pain in the back. Our team of experts track the nerves of sciatic pains and treat them by employing various methods. The causes of the pain can also be analyzed by the symptoms like lack of sleep, Aging, Depression, keeping an eye on the causes can best avoid the problem in the near future. With our highly reliable and accountable therapy sessions, we take care that our treatment is benefitting our patients’ at the most cost effective rates.